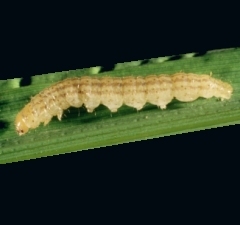 In the Delta rice fields, one of the most harmful pests is the rice stem borer (Chilo suppressalis). 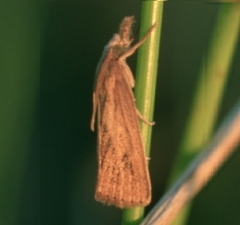 It is a lepidopter (Crambidae family) of twilight habits whose larvae bore holes in the canes in order to feed themselves with the inner tissues of the rice plant. This entails an important weakening of the affected plants. As a consequence, the resulting spikes are significantly less productive than those from healthy plants. The rice stem borer develops up to three generations throughout the year. Between late April and mid June, coinciding with the sowing season and the initial stages of the vegetative development of the rice plants, the first adults of the season appear (1st flight). They come from larvae which, in their majority, have been hibernating inside the canes of reeds (Phragmites sp.). These adults give rise to the first generation of larvae. During the month of July and until the beginning of August a second flight of adults is detected, originating from the larvae from the first generation. A big number of these larvae develop in parallel with the blooming and earing season of rice and by the end of August, they give rise to a third flight of adults.